Another of my granddaughter's current favorites. Funny! My second graders find this book to be very funny! personal reaction:Honestly, when I checked this book out, I was in a huge hurry and didn’t even skim through it. Once I got home I read it and was super surprised. It was actually really funny! Even though it’s considered an easy-to-read book, a lot of humor can be found in it! Fox’s character is so cute and quirky. The illustrations are awesome too. I’m a big fan of watercolors as a medium, so i’m a bit biased. But overall, I was really glad I ended up picking this book up! !read aloud: Since this book is comprised of three different stories, I would choose to read one story per day. An interactive activity to do in a first or second grade classroom after finishing the third story would be to compare and contrast all three stories. I would split the class into three groups and assign each of them one of fox’s stories. Together, students could come up with a list of character traits, themes, etc that they find in the story. After that, students could come up to the board and fill in a venn diagram to see what similarities and differences the three stories have!independent reading:This would be an awesome book for any first or second grader that are beginning to read more advanced books. 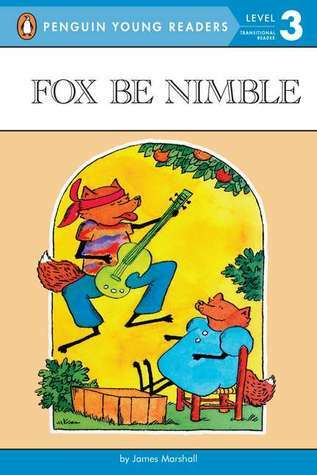 Fox Be Nimble is not quite a chapter book, but it’s more advanced than say a picture book. There are pictures on almost every page that directly correlate with the text, making it easy for readers to follow along and stay interested!narrative:Something I think this book could be useful in teaching is setting and characterization. You could introduce setting by discussing with students all of the different settings that Fox is in such as the Lings' house, his own home, the band room, and the parade. This is a great book to introduce setting because it is so easily identifiable. Characterization could also be introduced through this book by discussing Fox’s direct and indirect characterization. An example of indirect characterization would be Fox saying “I’m dying!” after scratching his knee. We now know that Fox can be slightly dramatic sometimes. Whereas direct characterization would be Fox saying “But I like showing off!”, which directly states what Fox likes without us having to infer. This books was so funny! Easy to use different voices to make it even more interesting. Read it aloud! More words but still many pictures. As much as we love the George and Martha books, by the same author, we *adore* Fox. He is the silliest fox you'll ever meet. My kids loved learning to read with Fox. A big hit as a read-aloud story with my kids when they were in the 3-5 year old range. This made my son laugh out loud.